NGC 6337 is a small, bipolar planetary nebula (PNe), also known as the Cheerio Nebula, in the constellation of Scorpius at about 5,200 light years distant. It is situated within a field of backround hydrogen nebulosity. Planetary nebula arise from the evolution of smaller stars (0.8 – 8 solar masses) that end up as a white dwarf. Often, this evolution is more complicated, as is the case of NGC 6337, where there is a binary pair of stars involved (Hillwig et al. Ap J, 140, 319, 2010). It is a current area of research how binary stars shape the structure of PNe. The field in the cropped image above is 14′ x 14′. 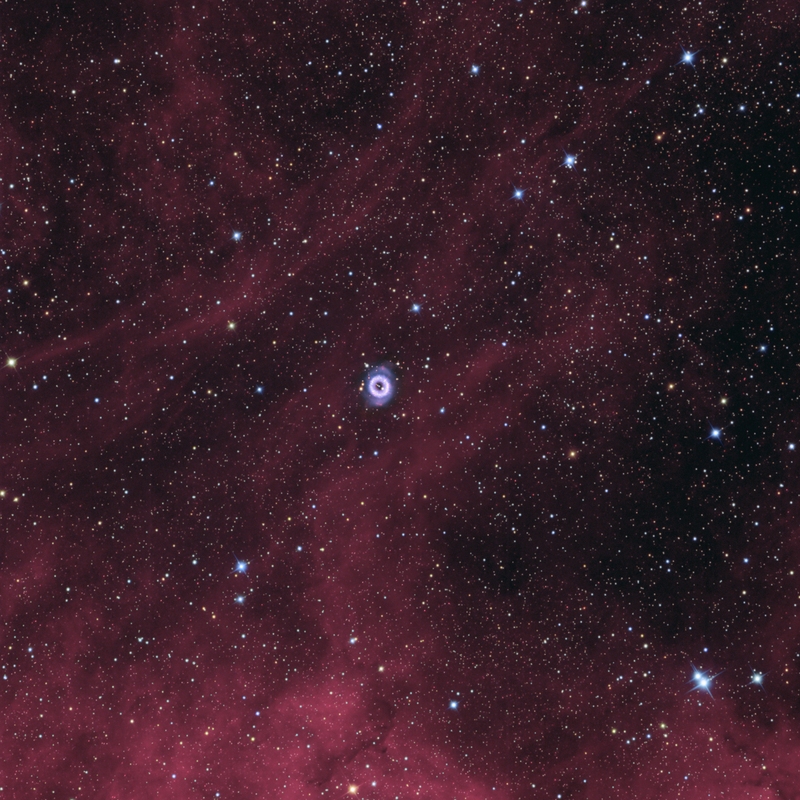 The bright, circular inner ring is approximately 0.9 arcminutes in diameter. This is the region commonly seen in images and is considered by Corradi et al. (ApJ, 535, 823, 2000) and Garcia-Diaz et al. (ApJ, 699, 1633, 2009) to be the thin waist of a nearly pole-on (perhaps tilted only 15 deg. to our line-of-site) bipolar planetary nebula. There is an extended halo that is elongated in the NW-SE direction and is about 1.5 arcminutes long. Thus, we might be looking mostly down into an expanding lobe of the PNe. Researchers refer to this as a bipolar collimated outflow. The nebula is bright in both hydrogen-alpha and oxygen emissions, as picked up by our 3 nm H-a and OIII narrowband filters, respectively. The bright inner ring has a number of bright “knots” that may be cometary knots. There is a darker region immediately surrounding the ring. 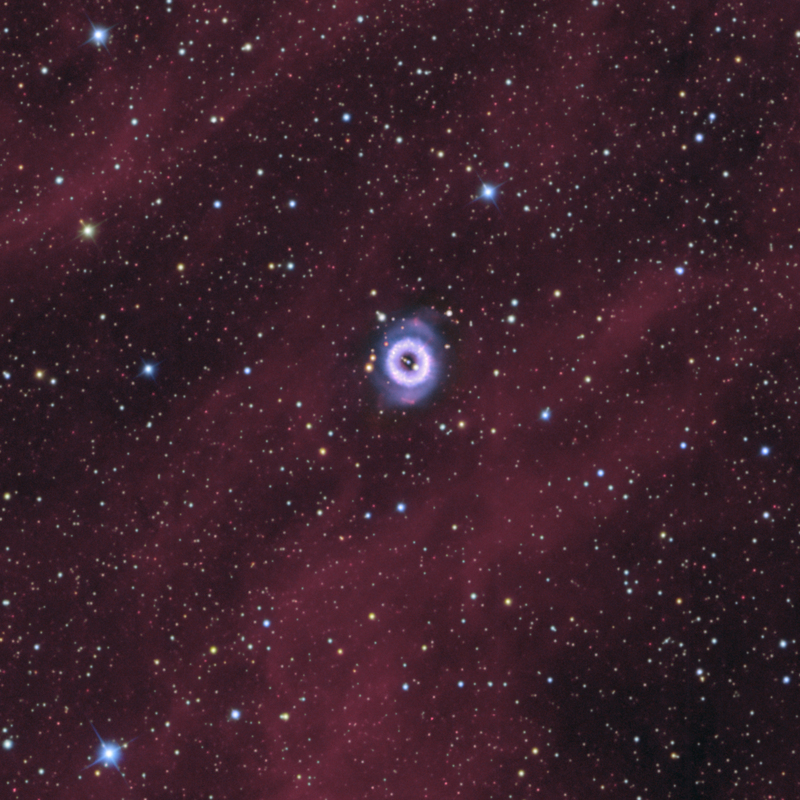 There also appears to be a radial “spokes” projecting into the halo region, similar to those found in the Helix Nebula. Lastly, there are two smaller lobes extending beyond the halo. Although this PNe is small for most amateur telescopes, the varied features are clearly discernable.